The UCS B200 M4 Blade Server delivers performance, flexibility and optimization for data centers and remote sites. This enterprise-class server offers market-leading performance, versatility, and density without compromise for workloads ranging from web infrastructure to distributed databases. 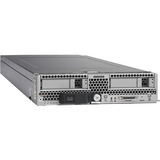 The Cisco UCS B200 M4 server can quickly deploy stateless physical and virtual workloads, with the programmable ease of use of the Cisco UCS Manager software and simplified server access with Cisco® SingleConnect technology. Based on the Intel® Xeon® processor E5-2600 v3 product family, it offers up to 768 GB of memory using 32GB DIMMs, up to two drives, and up to 80 Gbps I/O throughput. The Cisco UCS B200 M4 offers exceptional levels of performance, flexibility, and I/O throughput to run your most demanding applications. In addition, Cisco UCS has the architectural advantage of not having to power and cool excess switches, NICs and HBAs in each blade server chassis. Having a larger power budget per blade server provides uncompromised expandability and capabilities, as in the new Cisco UCS B200 M4 server with its leading memory-slot and drive capacity.